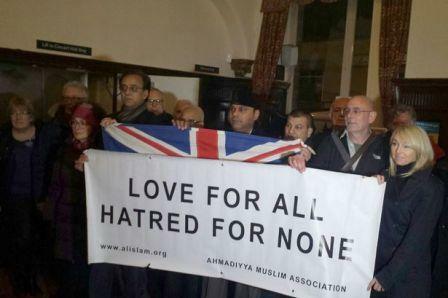 A united show by different faiths to condemn terrorist attacksPeople of all faiths came together in Huddersfield to condemn terrorism.They were at a mosque in Fartown for a specials service organised by the Ahmadiyya Muslim Community. The event attracted not only Muslims but Sikhs and Christians. Fatihul-haq, president of the Ahmadiyya Muslim Community Huddersfield South, said: “We condemn the actions of extremists wherever they may be, whatever their cause. We are with the people of France in sharing their pain.“This was an outrageous attack on the peaceful innocent members of the public and they are in our thoughts and prayers. Share the post "Muslims and other faiths unite in Huddersfield to condemn terrorism"